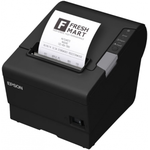 The receipt Printer is an important part of the Point of sale system.address, transaction date, products purchased, any discounts the customer received, customer account information, any loyalty program info (such as how many loyalty points customer has collected) and so on. 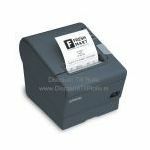 While an impact receipt printer uses more consumables (ink cartridges and receipt paper), it offers an affordable entry price compared to thermal receipt printers, may offer two-color printing, can print on 2-ply receipt paper, and withstands heat in restaurant kitchen environments. A thermal printer does not use ink -- it uses heat-sensitive receipt paper to create an image on the paper. Thermal receipt printers offer near-silent, speedy printing for fast-paced retail operations, or anywhere silence is appreciated. A thermal printer (or direct thermal printer) produces a printed image by selectively heating coated thermochromic paper, or thermal paper as it is commonly known, when the paper passes over the thermal print head. The coating turns black in the areas where it is heated, producing an image.